DALLAS – April 12, 2018 – Why does drinking alcohol or consuming sugar make us thirsty? An international study of mice in Texas and humans in Europe reveals an unexpected anti-dehydration mechanism. In a study published today in Cell Metabolism, UT Southwestern researchers identify a hormone that acts on the brain to increase the desire to drink water in response to specific nutrient stresses that can cause dehydration. The findings are reported by Dr. David Mangelsdorf and Dr. Steven Kliewer – who have run a joint laboratory at UT Southwestern since 2002. The Mangelsdorf/Kliewer laboratory has long studied the liver hormone FGF21, or fibroblast growth factor 21. In earlier research, they found that FGF21 acts via the brain's reward pathway in mice to suppress the desire for sugar and alcohol in favor of drinking water. "We knew that exposure to alcohol or sugar turns on production of FGF21 in the liver. What we now show is that this hormone then travels in the blood to a specific part of the brain, the hypothalamus, to stimulate thirst, thereby preventing dehydration," said Dr. Kliewer, Professor of Molecular Biology and Pharmacology and holder of the Diana K. and Richard C. Strauss Distinguished Chair in Developmental Biology. 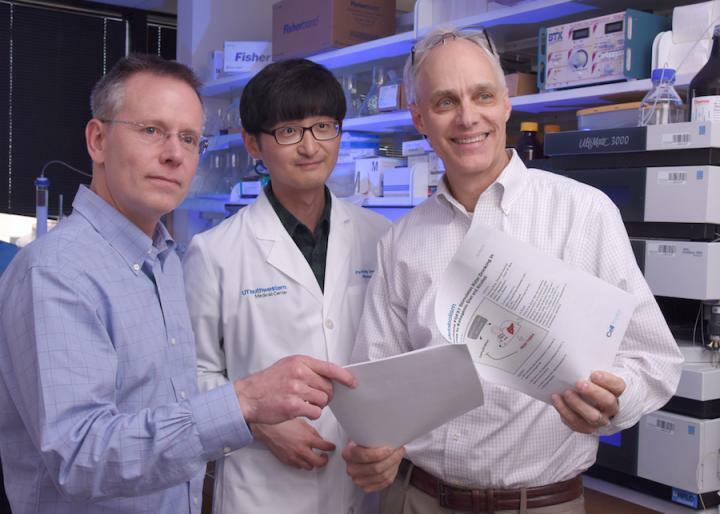 "Unexpectedly, FGF21 works through a new pathway that is independent of the classical renin-angiotensin-aldosterone thirst pathway in the kidneys." In mice, the study revealed, the hormone regulated hydration (water drinking) in response to nutrient stress. In one experiment, the researchers found that normal mice and mice genetically unable to produce FGF21 drank similar amounts of water when given the typical chow diet. However, a high-fat/low-carbohydrate ketogenic diet stimulated water drinking in normal mice while mice genetically unable to produce FGF21 failed to increase water intake in response to that nutritional stress. Those findings confirmed the hormone's role in the signaling pathway, the researchers said. A second important finding in this study is the very strong response to the hormone in humans, Dr. Kliewer said. In that part of the research, 21 study participants at the Medical University of Graz in Austria were randomly assigned to drink either a mixture of alcohol and juice, or juice alone. Hourly over four hours, researchers measured their FGF21 blood levels. In response to alcohol, FGF21 levels peaked at around two hours and fell after that. "This suggests that FGF21 might someday be used as a drug to limit alcohol consumption and protect against its effects in people," said Dr. Mangelsdorf, Chair of Pharmacology, Professor of Pharmacology and Biochemistry, and a Howard Hughes Medical Institute (HHMI) Investigator. "Those findings also suggest that FGF21 is regulated the same way in humans as in mice and that the process involves the expression and activation of certain proteins in the brain." The FGF21-induced thirst response appears to depend on another signaling pathway in the hypothalmus, the β-adrenergic circuit, the researchers said. "There are old studies from the 1970s suggesting that this pathway might regulate thirst. Our data suggest that FGF21 might work through that pathway as well," said Dr. Mangelsdorf, who holds the Alfred G. Gilman Distinguished Chair in Pharmacology and the Raymond and Ellen Willie Distinguished Chair in Molecular Neuropharmacology in Honor of Harold B. Crasilneck, Ph.D.
For a long time, feeding behavior has been emphasized in metabolic research rather than hydration. This study suggests a change may be on the table, the researchers said. "To put this in context, we always look at food intake, and the metabolic field has spent comparatively little time studying water intake. This study suggests that we should think more about hydration and how it might contribute to metabolism," Dr. Kliewer said. Co-authors include lead author Dr. Parkyong Song, a postdoctoral researcher in Pharmacology; Dr. Christoph Zechner, a physician-scientist and Instructor in Pharmacology, Internal Medicine (Endocrinology), and in the Charles and Jane Pak Center for Mineral Metabolism and Clinical Research at UTSW; graduate student Genaro Hernandez, Pharmacology; Dr. Yang Xie, Associate Professor of Clinical Sciences and Bioinformatics; Dr. Varun Sondhi, a third-year resident; Dr. Ming Chang Hu, Associate Professor of Internal Medicine and Pediatrics and holder of the Makoto Kuro-o Professorship in Bone and Kidney Research; and Dr. Orson Moe, Director of the Charles and Jane Pak Center for Mineral Metabolism and Clinical Research, Professor of Internal Medicine and Physiology and holder of The Charles Pak Distinguished Chair in Mineral Metabolism and the Donald W. Seldin Professorship in Clinical Investigation. Researchers at Columbia University and at the Medical University of Graz in Austria also contributed. The work received support from the Austrian Research Promotion Agency, a Pew Latin American Fellowship, the National Institutes of Health, The Robert A. Welch Foundation, the Cancer Prevention and Research Institute of Texas, the National Science Foundation Graduate Research Fellowship Program, the Pak Foundation, and the HHMI. UT Southwestern, one of the premier academic medical centers in the nation, integrates pioneering biomedical research with exceptional clinical care and education. The institution's faculty has received six Nobel Prizes, and includes 22 members of the National Academy of Sciences, 17 members of the National Academy of Medicine, and 14 Howard Hughes Medical Institute Investigators. The faculty of more than 2,700 is responsible for groundbreaking medical advances and is committed to translating science-driven research quickly to new clinical treatments. UT Southwestern physicians provide care in about 80 specialties to more than 100,000 hospitalized patients, 600,000 emergency room cases, and oversee approximately 2.2 million outpatient visits a year.